Fabulous location, beautiful view of the beach . Excellent location.Very helpful staff.Our room was great. The beds were comfortable. Unfortunately we could not locate the remote for the Air Conditioner. The breakfast deal was great. We are looking forward to staying again in the near future. Enjoyed our quick overnight stay. Great location. Staff were lovely and fulfilled our booking request just as we asked, thank you. Room was clean, tidy. Plenty of space. Clean and comfortsble. Wuiet area. Great family getaway We were welcomed as soon as we arrived, the apartment was very clean and had all the amenities we required. Even though it was winter the beach was right on our doorstep so we could enjoy the amazing sunset. Would be more than happy to stay again. Hitting up Bunbury? lastminute.com.au has you well and truly covered. Whether you're thirsty for the luxe life or want to keep your stay straightforward, you'll find the perfect hotel for your style and budget. 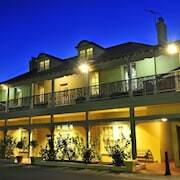 Check out our 17 hotels within a 5-kilometre radius of Bunbury's centre. Planning to have a few wild ones on the town? 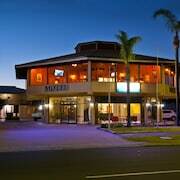 You won't get any more central than the Mantra Bunbury and the Quest Bunbury Apartment Hotel! You could also have a look at The Clifton & Grittleton Lodge and the Quality Hotel Lighthouse. Organise a visit to Dolphin Discovery Centre, an attraction constructed to feature different species of amazing marine animals. Need a room for the night close by? No dramas, we've got you covered. 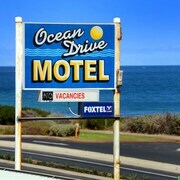 Best Western Plus Hotel Lord Forrest and Admiral Motel Bunbury are practically around the corner. Step outside, head to Leschenault Inlet and unwind to the sounds of waves rolling in. 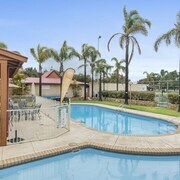 Bunbury Apartment Motel and Discovery Parks – Koombana Bay are a couple of nearby hotels if you don't want to stay far away. Budget accommodation no longer means messy rooms and bad service. 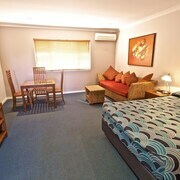 Wander Inn – Bunbury Backpackers is a seriously good option if you're after a cheap place to crash. If that's too basic, Dolphin Retreat Bunbury is another to consider. Still trying to find accommodation? The Mercure Bunbury Sanctuary Golf Resort and the Wellington Forest Cottages & Conference Centre might be what you're after. The first is 6 kilometres from town, while the latter is 25 kilometres away. Alternatively, make your way 20 kilometres away from central Bunbury to the Evedon Park Bush Retreat. Sure, you could spend your whole holiday just in Bunbury, but you're gonna have FOMO. For some truly epic memories, you've gotta take a look around Southwest's other attractions. Don't even think of going home without visiting a few of the region's stunning rural landscapes and beaches. History museums are also worth a peek. Visitors with an appetite for adventure can also fill their days with a little mountain biking and rock climbing here. Don't blow through before you've gone to the Wonnerup House and Ludlow Tuart Forest in Busselton. 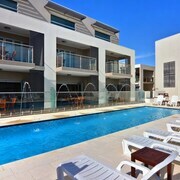 If you want to visit Busselton, consider the rates at the Amalfi Resort and Comfort Inn Busselton River Resort. 50 kilometres to the east of Bunbury you'll find Collie, which is home to the Banksia Motel Collie and Collie Ridge Motel. If you're staying in Collie, make sure you visit the Fred Sharte Memorial Lions Park and the Eden Park Par 3 Golf Course. 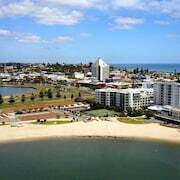 Bunbury awaits! Let lastminute.com.au take care of the boring stuff while you grab your passport.